Tiger Cubs is a program for first graders (or 7-year olds) and their adult partners that stresses simplicity, shared leadership, learning about the community, and family understanding. 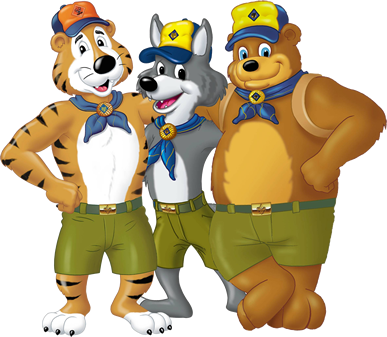 The Tiger Cub program introduces youth and their adult partners to the excitement of Cub Scouting as they "Search, Discover, and Share" together. The Tiger Cub program is conducted on two levels. First, the Tiger Cub and their adult partner meet in the home to conduct activities for the whole family. Second, the Tiger Cub and their adult partner meet twice a month with other Tiger Cubs and adult partners in the den, using the planned "big idea" (or theme) for their activity during one of the meetings. A Tiger Cub adult partner team hosts each den meeting. Youth can join Tiger Cubs as soon as they graduate from kindergarten and are eligible to participate in their pack summer activities, Cub Scout day camp and Resident Camp. Find a pack to join near you at www.beascout.org. Tiger Cub Den Leadership: The success of a Tiger Cub den depends on active, enthusiastic families working alongside a knowledgeable, well-trained den leader. The Tiger Cub den leader plans and carries out a year-round program of activities for the Tiger Cub den and gives the program continuity. Using the concept of shared leadership, the Tiger Cub den leader works with a different adult partner team each month to plan two den meetings, a Go See It outing, and the den’s part in the pack meeting. Some teams may serve more than one month, depending on den size. Shared leadership is a key element of the Tiger Cub program because direct adult involvement is important for youth at this age. Through this sharing of leadership, each youth and adult partner team is given an opportunity to lead. Shared leadership also brings a wealth of knowledge and variety to the program as each host team has something different to bring to the program. As a Tiger Cub den leader, you will provide experience and continuity throughout the program year. A variety of resources are available for Tiger Cub Scout leaders.